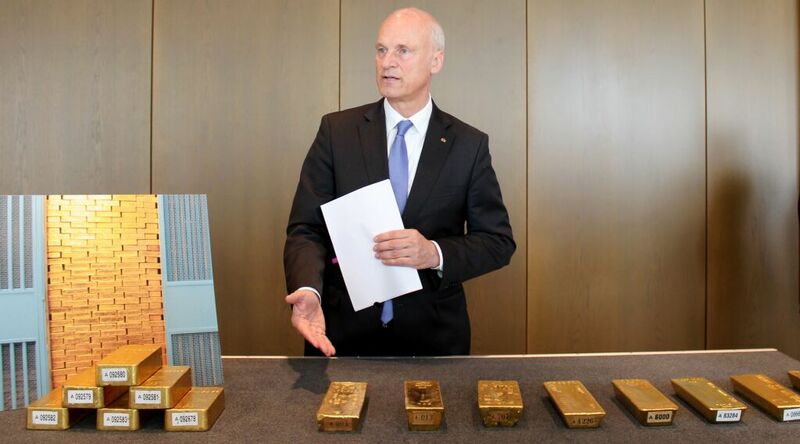 The Bundesbank announced yesterday that it had repatriated 300 tons of gold stored in New York City ahead of schedule. The German Central Bank announced on Jan. 16, 2013, that it would relocate the gold from New York and Paris to Frankfurt. This decision was made after the U.S. Federal Reserve refused to submit to an audit of German gold held in U.S. vaults. The Germans initially estimated it would take seven years to repatriate the gold, but if they complete the French repatriation by the end of 2017, they will have completed the task three years ahead of schedule. The 300 metric tons of gold repatriated from New York equates to 20 percent of Germany’s gold holdings in the United States. Thiele also announced that Germany would repatriate 100 percent of its gold holdings in France by the end of 2017. The Bundesbank currently stores 47.9 percent of its gold in Germany, 36.6 percent in the U.S., 12.8 percent in England, and a mere 2.7 percent in France. Once the transfers are complete, Germany will hold half its 3,378 tons of gold in Frankfurt, with the balance in New York and London. Despite declining relations between Germany and the administration of President Donald Trump, Thiele said there are currently no plans for further gold transfers from the United States, and Mr. Trump’s presidency doesn’t change the situation. The fact that Germany is repatriating so much gold from America at all, however, shows that the level of trust between the two nations is at a postwar low. This is big news, but few know what it really means. To understand how this announcement will eventually affect you, you have to understand why so much German gold was held in New York, London and Paris in the first place. Why doesn’t Germany hold its own gold? According to the Bundesbank, the reason is twofold. First, storing gold in America makes it easier to sell, or pledge, in case of an economic emergency. It is easier to trade to others who can then quickly take ownership. The second reason is that it was deemed safer to spread Germany’s gold out during the Cold War to protect it from the Soviets. According to the Bundesbank, that is no longer a concern. That Germany feels safe enough to bring it home speaks volumes about Germany’s changing relationship with Russia. But there is a third, unmentioned—and far more important—reason Germany doesn’t keep its gold at home. It goes back to World War ii. When the Allies finally stopped the German death machine in 1945—for the second time in 27 years—they purposed to ensure that Germany could never again destroy world peace. Forcing Germany to store its gold overseas was the primary financial mechanism preventing Germany from ever starting another war. As analyst Byron King noted, “One way for the U.S., Britain and France to keep a leash on Germany was to keep ‘German’ gold under control outside of that country’s borders” (Daily Resource Hunter, Jan. 22, 2013). As long as the Allies controlled Germany’s gold, the Allies had a conqueror’s insurance policy that ensured Berlin would not again disturb the peace. Without its gold, Germany’s currency and thus its economy, could be destroyed virtually overnight. This will prove to be a tragic mistake. With President Trump threatening to undermine both nato and the European Union, you can be sure that German leaders are discussing how they can shore up their economic and military might in a world where America isn’t their ally. Germany’s old World War ii foes will soon regret turning Germany loose. The world is about to see a much stronger Bundesbank—and consequently, a more aggressive German nation. German confidence and power grows with the clink of each brick it adds to its towering stack of gold!